If you weigh over 350 pounds, you can eat at the Heart Attack Grill for free (according to the Las Vegas eatery's slogan). 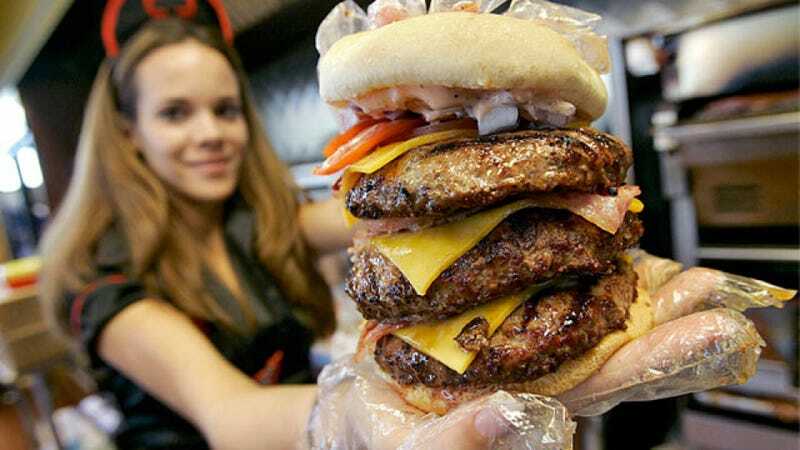 But if you should keel over, gripping your chest in agony, while scarfing down a triple bypass burger (that's what the monstrosity pictured up top is called), don't expect any of the scantily clad waitresses "nurses" to come running — chances are, they'll just think you're kidding. According to NPR, that's exactly what happened a few nights ago when one of the patrons (called "patients" by restaurant staff) had a heart attack while eating at the bastion of morbidly excessive gluttony; the restaurant's owner, "Doctor" Jon Basso (not a real doctor — though he has, in the past, owned a chain of Jenny Craig weight-loss centers), initially thought the incident was a joke. "One of the nurses came back to me and said, 'Dr. Jon, we've got a patient who's in trouble,'" said Basso in an interview with a local news station. I don't know what's more ridiculous — the fact that somebody actually had a heart attack at the Heart Attack Grill less than five months after it opened its doors; that Basso still thought to refer to the waitress as a "nurse," even when he was being interviewed about one of his patrons suffering from a heart attack; or the idea that one of the staff would still have the composure necessary to stick to the restaurant's whole doctor/nurse/patient schtick in the midst of an actual medical emergency. Say what you will about the restaurant's... unique business model — to be that obtuse requires some serious dedication. The heart-attack victim — an unidentified man in his forties, shown here being wheeled out of the restaurant — is said to be alive and recovering. Who knows, maybe he can become the restaurant's new spokesperson — the previous one died of health complications last March.